This is Sharon who was photographed whilst dancing at the Studio - we were going to use this photograph for the cover of the Dvd's but we decided against it. These are great photos of our workshops in Rome, Italy. The students are really keen and we have lots of fun. This is a great picture of Kenny and Sharon taken at the studio. This is the day we filmed the first Dvd and it was manic. 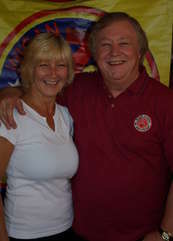 Another a great picture of Sharon and Russ Winstanley. Russ kindly spared his valuable time to assist us when making the Dvd's. We had a great time and as the picture shows, we got along really well and all had a good time listening to the great stories of Wigan. Thank you Russ. I did some workshops in various schools in Blackpool in March 2014. The children were fantastic and as you can see we made friends really quickly.The children being taught a northern soul dance move, they were great at spinning!! next generation soulies me thinks!! All the children keeping the faith! We had a fantastic time teaching the children in Blackpool. They were really great to work with and they learned alot about pop sub-cultures and especially northern soul. They were proud to know that one of the great venues was in their town - the fantastic Blackpool Mecca. What a great time we had at the Isle of Wight Festival - Just Brilliant northern soul sessions. This is our fabulous OTSO Bar Venue in Huddersfield. It has a great atmosphere and the bar is OPEN!!!! Me with Sharon from the fabulous SIGNATURES. If you have not seen this band yet, go see them!!!! This was taken at Thoresbury Hall last year. It was a great Soul Weekend. The Fabulous TOMMY HUNT. This was during his brilliant performance at the Soul Weekend at Thorsebury Hall last year. Cannot wait to see him again. He truly is a Legend. I love this man. I won a photo shoot in Hurghada, obviously this was for my superior dancing!! Just goes to show how dancing can keep you fit! !